This is a Great way for friends or family of 2-3 to learn how to surf together in a small group. So what are you waiting for, grab some friends or family and Learn how to Surf all together! ALL EQUIPMENT INCLUDED! Surfboard, Wetsuit, UV Protection Rashguards, and Leash. **If you do not have a full group of 2-3 people , you will be subject to pay the difference if we are not able to sign other surfers up for your incomplete lesson. Ideal for friends and family looking for a fun time learning how to advance in surfing all together ! Minimum of 2 people for this package. Looking to go beyond the basics of Surfing? Then this is the way to go! With our 5 lesson package you and your family or friends will all advance together beyond the basics of surfing. 5 separate 90 minutes Semi-Private Surfing Lessons. 1 Instructor for 2-3 Students. ALL EQUIPMENT INCLUDED. 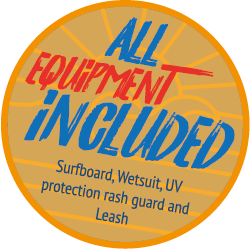 Surfboard, Wetsuit, UV Protection Rashguards, and Leash. OUR GUARANTEE: IF YOU ARE NOT STANDING ON THE BOARD AT THE END OF YOUR LESSON, YOUR NEXT LESSON IS FREE! Pacific Surf Schools team of instructors will work with you individually on your surfing technique to ensure that you learn to surf the correct way, without creating “bad habits”. We guarantee surfing results after your first lesson. LEARN TO SURF WITH THE BEST AND SAFEST SURF SCHOOL FOR ONLY $75. It is amazing how proper SURF instruction can accelerate your learning curve, relieving most frustrations beginner surfers endure. Our personal, friendly, qualified instructors will encourage and guide your rapid progression. If you don’t feel like learning to surf on your own, but you would like a familiar face in your group, semi private lessons are the right thing for you! You can take your friend, spouse or sibling and enjoy a fully personalized attention from the instructor. Semi private lessons are somewhere between private and group lessons. While private surfing lessons might seem lonely to some, others might feel group lessons are too crowded. It all depends on your preferences, but if you can’t decide between private or group lessons, you can’t go wrong with semi private lessons. Semi private lessons are ideal for couples who want to spend quality time together by doing something exciting. It’s no wonder many choose surfing – it’s challenging, it’s exciting, it’s life-changing! The instructor adapts to the skill level and dynamics of the group, so the group makes progress as a unit, but also as individuals. Share the excitement of learning how to surf with a select group of friends or family members. Semi private lessons give you a unique opportunity to have the feeling of private instruction, while learning as part of a group. Fun and memorable moments are guaranteed! DUE TO HIGH VOLUME, WE ENCOURAGE YOU TO BOOK YOUR PACKAGE ONLINE TODAY! ONCE PACIFIC SURF SCHOOL HAS RECEIVED YOUR PAYMENT, YOU WILL RECEIVE A CONFIRMATION E-MAIL WITH FURTHER INSTRUCTIONS AND DETAILS. * When booking group/semi-private lessons please contact us 24 hrs prior to the day of your lesson to ensure that group requirements are met. “Catch the experience” with our brand new, one-of-a-kind, 2 day progressive Surfing Experience Group Package. Included is an ALL DAY surf board & equipment rental directly following your lesson on both days! Each lesson begins at 9 am Saturday and Sunday and runs for 1 1/2 hours. Pacific Surf School is a licensed business and permitted surf school and camp. We maintain the operation requirements of the City San Diego Surf lessons and camps permit. In our 30 minute land lesson, you will learn and practice a variety of different pop up techniques that you will need to know before heading out into the ocean to catch your waves. Now that you have learned the basics of safety and pop ups, it’s time to put your new skills to the test! Spend the rest of your time in the ocean surfing with your instructor. Get ready for loads of waves, wipe outs and of coarse tons of fun! Basic wave reading including all possible factors. Water safety and ocean awareness, basic ocean safety, paddling and positioning on the board. Due to high volume, we encourage you to book your lessons online right now to warranty your lesson. Once Pacific Surf School has received your payment, you will receive a confirmation e-mail with further instructions and details about your class.